1. Pull the release knob to unlatch the hood. 2. Push the secondary latch lever to the left and lift the hood. 3. 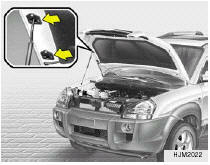 Hold the hood open with the support rod. 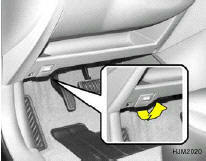 Before closing the hood, return the support rod to its clip to prevent it from rattling. Lower the hood until it is about 1 ft. (30 cm) above the closed position and let it drop. Make sure that it locks into place. 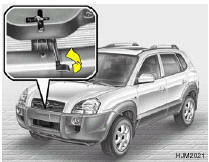 CAUTION: Make sure that the support rod has been released prior to closing the hood. WARNING: o Always double check to be sure that the hood is firmly latched before driving away. If it is not latched, the hood could open while the vehicle is being driven, causing a total loss of visibility, which might result in an accident. o The support rod must be inserted completely into the hole provided in the hood whenever you inspect the engine compartment. This will prevent the hood from falling and possibly injuring you. o Do not move the vehicle with the hood in the raised position, as vision is obstructed and the hood could fall or be damaged.